In the wake of the Yankees' 5-2 Game 2 win over the Twins, the baseball chatterati are going to want to talk about Hunter Wendelstedt's "controversial" non-strike call on Lance Berkman in the seventh inning. It was a 1-2 count, the ball seemed to clip a corner, Wedelstedt didn't call it, and Berkman smashed a double on the next pitch, giving the Yankees a lead they'd never relinquish. By the end of the game, the history of Wendelstedt and Twins manager Ron Gardenhire (who was ejected protesting the call) was trotted out, along with fancy pitch graphs that show that Wendelstedt didn't exactly call the whole game by the book. But it was one pitch, a borderline one, in a game the Twins lost by three runs. Those (justifiably) hungry for robot umpires might use the pitch as a data point in their arguments, but it's not why the Twins lost. The Twins lost because of Andy Pettitte. This whole game, the latest droplets in the endless Chinese water torture the Yankees have put the Twins through over the last half-decade, was about Andy Pettitte. The major concern for the Yankees coming into the playoffs was of course their rotation, and Pettitte, who had looked awfully shaky over the last month, was at the center of those concerns. It seemed the Yanks' rotation plans were "Sabathia" "Hughes" and "well of course Andy Pettitte always pitches Game 2." But tonight, he looked like 2000 Andy Pettitte, throwing seven innings, giving up two runs and never appearing to drop even a bead of sweat. Pavano couldn't match him; the seventh inning was the breakthrough that was coming all along. Pettitte was free and easy throughout, particularly in a massively clutch yet matter-of-fact seventh inning of his own; he didn't just look healthy, he looked inevitable. In these first two games, the Yankees have looked nothing but inevitable. They haven't been spectacular, they haven't had everything fall perfect and their offense has been mostly limited to a couple big innings. The Twins have had roaring crowds desperate to vanquish the Yankee banshee, and their team has taken early leads to inspire them each game. And the Yankees, still, have methodically come back, taken a lead, handed the ball to Kerry Wood and Mariano Rivera and gone home happy. This Yankee team is different than the ones of the dynasty of the late '90s, but they have that "obviously we're going to come back and win this" look we all remember from those teams. 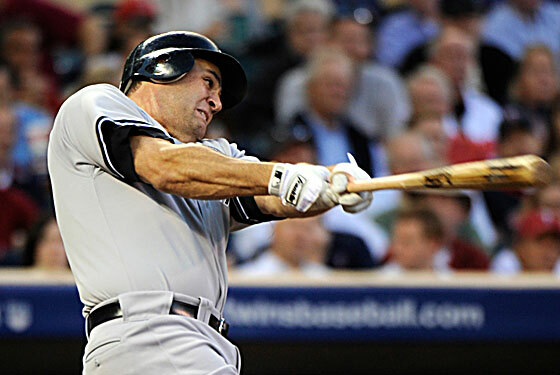 The Yankees didn't have that look last year; they were too hungry, too rabid to atone for a year outside the playoffs. But this team looks comfortable, going through all their motions, hitting all their marks, and winning playoff games like it's the most natural thing in the world. Lance Berkman, Curtis Granderson, Kerry Wood, playing like they've been winning World Series their whole lives ... maybe it really is the uniforms? The Yankees are making the Twins' lives miserable again. Same as it ever was.